This is a fun shake, especially for those diehard fans of cookies and milk. And when they’re served this way, you won’t be chasing broken cookie pieces around the cup of milk. In a blender, combine ice cream, milk, chocolate chips, and chocolate sandwich cookies. Blend until frothy. Pour into glasses and serve immediately with straws. Garnish with a dollop of whipped cream, if desired. 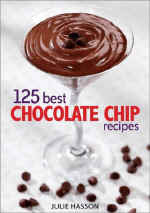 Variation: Substitute chocolate chip cookies for the chocolate sandwich cookies.